Materials: Fiberglass with a grey concrete finish. Care instructions:Â Clean with a soft, damp cloth only. Do not use detergents or bleach. Abrasive cleaners, acids or strong solvents will damage the finish of this product. The Newport Collection features sleek, industrial designs cast from heavy duty fiberglass with a realistic natural grey concrete finish. The Newport Rectangular Concrete Planters are the perfect compliment to your contemporary indoor houseplants or outdoor landscaping. Use them separately or in multiples for a clean but dramatic plant display. 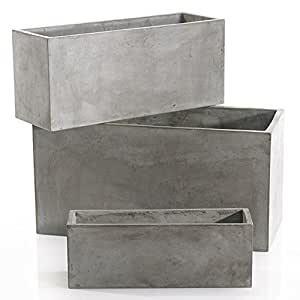 The Newport Rectangular Concrete Planter does not have a drain hole, so it can be used for indoor applications (we recommend using a plastic liner). Â Or drill a drain hole for outdoor applications. The Newport Rectangular Concrete Planters are available in 27.5-inch or 31.5-inch lengths. Â Fill them with succulents, horsetail reeds, boxwood or any sculptural species to make a modern statement in your home or garden. Due to the weight and special handling required for these pieces, a minimum of two planters must be purchased; price shown is for one set.